The Khumbu region of Nepal is one of the special mountain areas in the world. Traveling here gives individuals a chance to experience the incredible Sherpa culture, and to trek through the awesome panorama of the Himalayas. 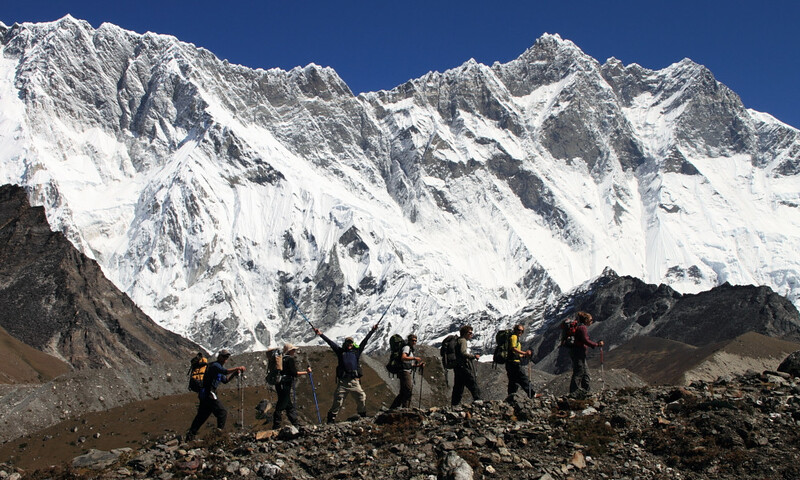 Join Mountain Guides International for an unforgettable trip to the Khumbu valley! The Khumbu region of Nepal is one especially unique mountain areas in the world that lends itself to daydreams and wishlists. Traveling here gives individuals a chance to experience the incredible Sherpa culture, and to trek through the awesome panorama of the Himalayas. Our treks include options as varied as a day hike up Kala Patar near the Everest base camp, travel over the Chola pass into the Gokyo Valley, and seeing the unique Mani Rimdu festival and mask dance at the Tengboche Monastery. 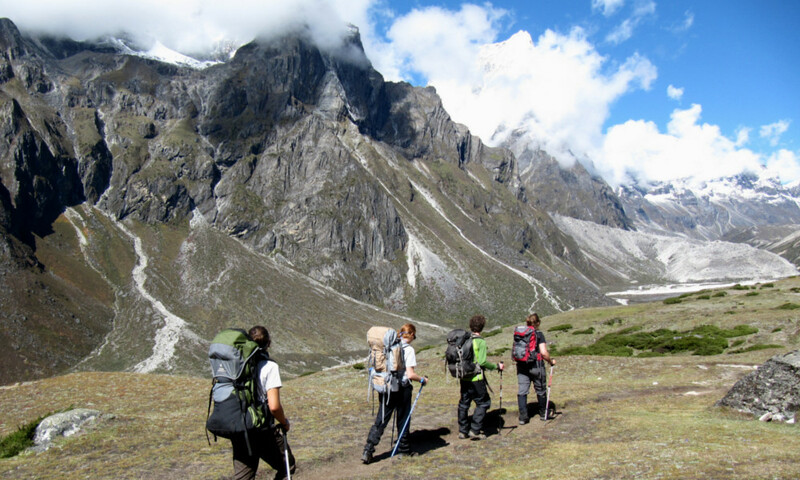 Our Nepal treks include fantastic climbing options for all skill levels and abilities. Mountains in the Khumbu, which are frequently climbed, include Island, Mera, Pokalde, Kwangde, and Lobuche Peaks. While trekking we stay in teahouses, which offer the benefits of good food, comfortable lodging, and the famous Sherpa hospitality! 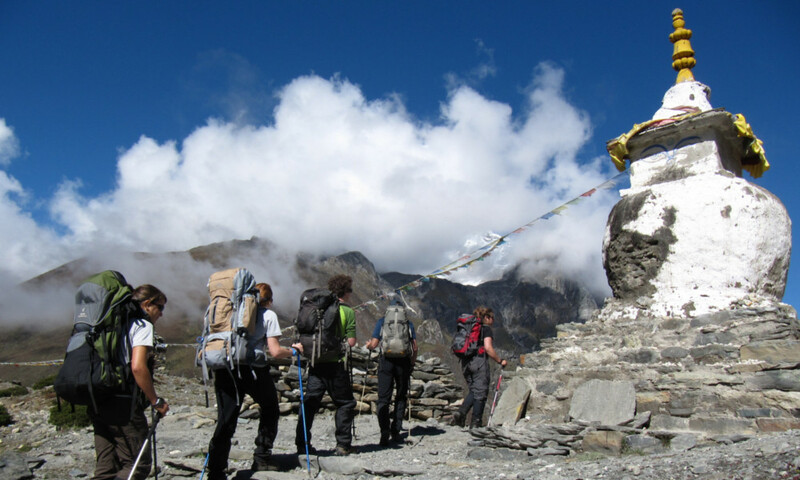 We would also be happy to send you information on our climbs and treks in other parts of Nepal and the Himalayas. Please contact us for detailed itineraries and additional information. 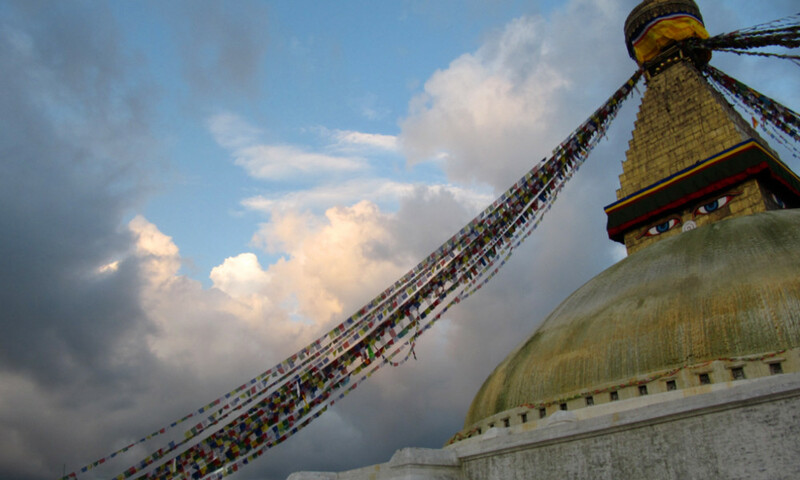 KATHMANDU: Kathmandu is the starting and ending point for our treks and climbs in Nepal. It is a fascinating city with many incredible sights. While in Kathmandu, we will visit the Hindu and Buddhist temples of Syhumbunath, Bodanath, and Pashupatinath as well as the historic Durbar Square. 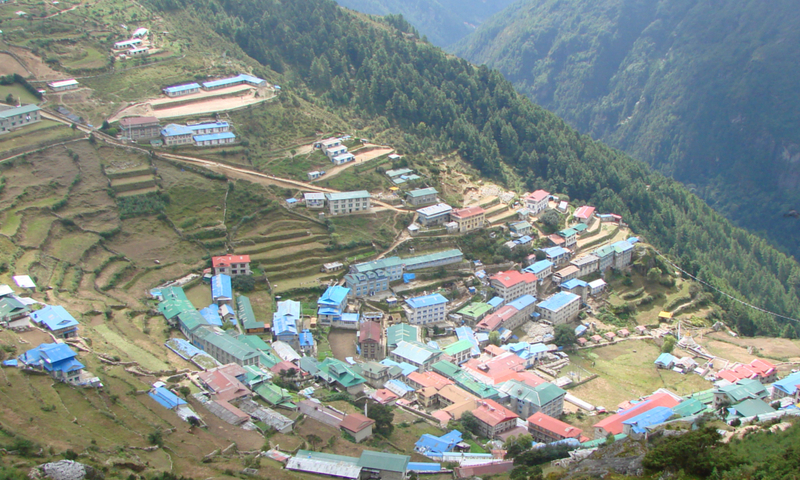 NAMCHE BAZAAR: This village is the cultural center of the Khumbu. It is also the hub for trade and commerce in the valley. The weekly market between lowland traders and the highland Sherpa people occurs here. Traders drive their yak teams from as far away as Tibet to participate in the market!We will spend a couple of days here acclimatizing and exploring the area. TYANGBOCHE MONASTERY: This monastery is the religious center of the Khumbu. Many of the Sherpa peoples most important religious festivals and ceremonies occur here. We will likely spend another day here acclimatizing and taking in the incredible views of Thamserku, Kangtaga, Ama Dablam, and Mt Everest. IMJATSE CLIMB (ISLAND PEAK): Our route is either the South ridge or East face, both are moderate snow and ice climbing (all climbing is completely optional). 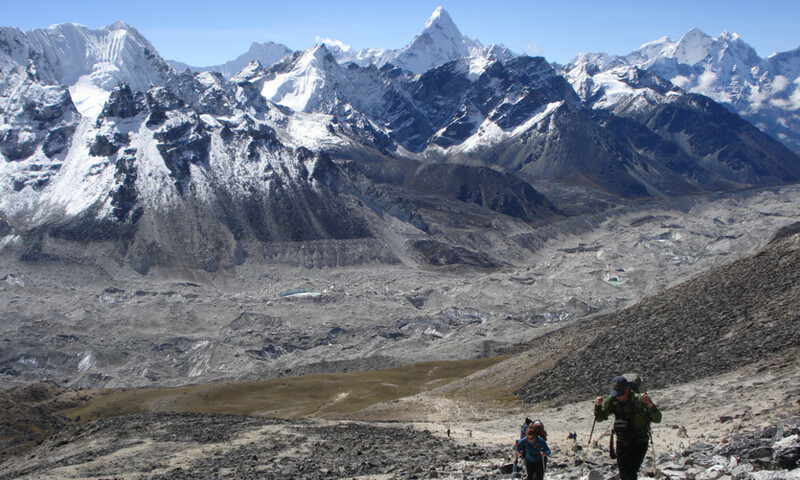 This peak provides stunning views of the surrounding peaks including Everest! Other possible climbing objectives include Pokalde, Mera, and Lobuche peaks. If you choose not to climb we will do one of the many fantastic side hikes in the area. OTHER OPTIONS IN THE UPPER KHUMBU: There are many other outstanding options for climbing and trekking in the Khumbu including an ascent of Kala Patar, or, travel over the Cho La pass into the Gokyo valley! OUR GUIDES: Mountain Guides International guides are professionals. They bring a wealth of experience from guiding throughout Alaska and the world, and they genuinely enjoy sharing their knowledge. Their skill and experience ensure our guests the best possible experience during their trip. Your safety and enjoyment are their primary goals. The following is a tentative itinerary. We will meet you at the airport and take you to our lodging in the Thamel District of Kathmandu. This is an exciting and intersecting part of the city and allows easy access to some of the great temples. The afternoon will be spent sightseeing. Day 2: Flights to Lukla (9403ft) and Phakding. This is a 40-minute flight into about a small Sherpa town in the Khumbu. Lukla is an exciting place in the spring and the fall; the village bustles with porters and the Sherpa people organizing expeditions and the transport of goods and supplies to villages further up the valley. After lunch we will hike a few hours to Phakding for the night. This is a big day, hiking ancient trails, crossing suspension bridges, and climbing to Namche Bazaar at 11,300 feet. Namche is the cultural center of the Khumbu. Home for the weekly market where traders from the lowlands trade with the highland Sherpa people. We will spend 2 nights in Namche exploring and acclimatizing. Tengpoche is the largest and most active monastery in the Khumbu. There are great views of both Mt Everest and Ama Dablam from the site. We will spend 2 days here for further acclimatization. We can do a variety of side hikes, or simply take in the views of the monastery. Day 8-10: Tengpoche to Gokyo Ri: The views of Mt. Everest from Gokyo Ri are phenomenal. We’ll spend 2 days there for even more acclimatization. Day 11-12: Cho La pass (17,377ft): We climb over this high pass and descend into Lobuche. Day 14: From Gorak Shep, we’ll ascend up to Everest Base camp for the day and explore the tent city surrounded by glacial debris below the ridges of Everest and Nupste. We will return to Gorak Shep in the evening. Day 15: We’ll enjoy a spectacular day hike to the summit of Kala Patthar (18,192ft), the high point for the trip. After summiting, we’ll head to Lobuche for the night. Day 16-19: We’ll descend down the Khumbu and return to Lukla. Depending on timing there may be time for some side hikes. 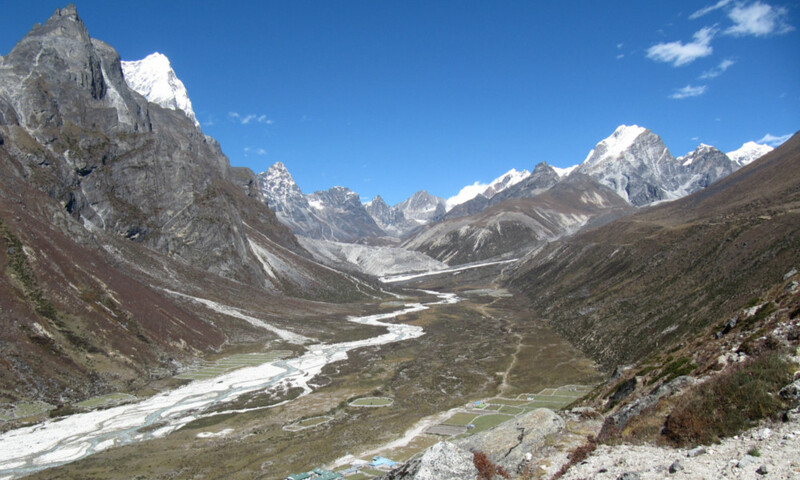 On our way down valley, we’ll spend nights in Lobuche, Dingboche, Tengboche and Namche Bazaar. food on the trek or climb, group climbing and camping equipment, American guide and Sherpa support. What’s the difference between the 14 and 21 day options? Length: 21 days Kathmandu to Kathmandu. 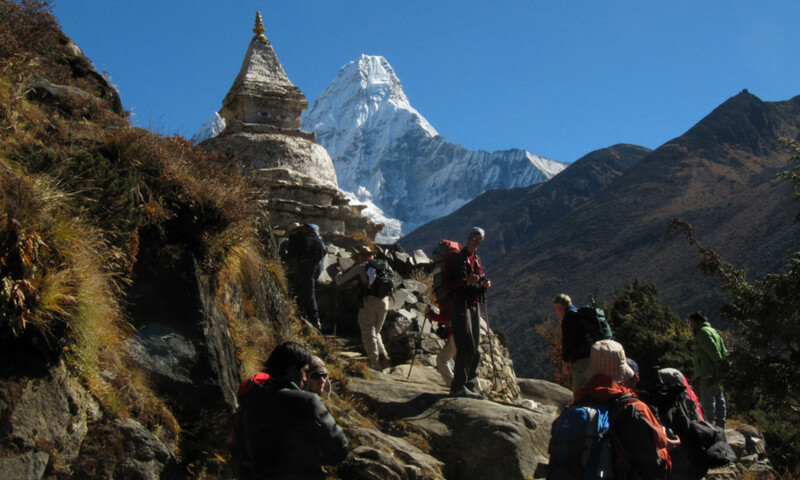 We also offer a 14-day Khumbu trek that goes to Namche Bazaar and the Tengboche monastery. The 21 day option allows for more trekking, more acclimatization, and overall, more sights! Difficulty: moderate to difficult trekking at altitude. Most climbing options involve moderate climbing on snow and ice. Lodging: The tea houses are typically two beds to a room, with a 3 inch foam mattress. Guests utilize shared bathrooms. The common areas are warm and comfortable with a wood burning stove and friendly conversation. Toilets vary from tea house to tea house, there are a combination of pit toilets and flush toilets. Hot water is available upon request. Trip Itinerary – Printable detailed trip itinerary for 14 days. Trip Itinerary – Printable detailed trip itinerary for 21 days.